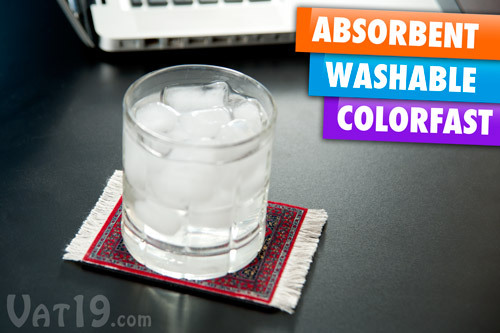 CoasterRugs: Washable, colorfast, and absorbent coasters with rug designs. 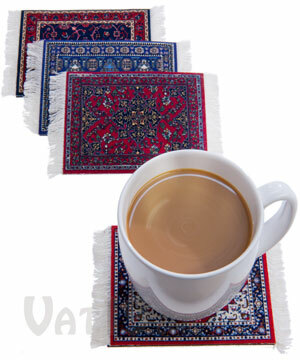 Plush, absorbent, and durable coasters with intricate rug designs. CoasterRugs combine advanced fiber technology with stylish rug designs from across the globe. The surface of each CoasterRug Drink Coaster is made from millions of ultra-plush and ultra-tough nylon microfibers. While they feel as smooth as velour, CoasterRugs are by no means fragile; they can take quite a pounding. In fact, power washing is an acceptable method of cleaning. Highly absorbent and featuring an eighth-inch-thick natural rubber backing, CoasterRugs are colorfast to ensure they remain vibrant for years. Each pack includes four CoasterRugs. Choose from Oriental and International sets. CoasterRugs are eye-catching; each one features a beautiful and intricate design, a tasteful fringe, and millions of nylon microfibers. The patented Lextra graphics process ensures that the colors never run or fade, and the rubber backing provides superior absorbency. Plus, they look like miniature area rugs! CoasterRugs are absorbent, durable, and colorfast. And they look like cute little rugs. 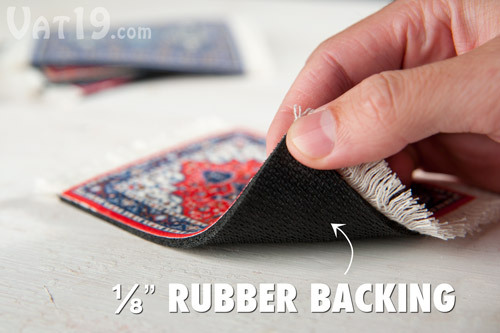 The absorbent natural rubber backing ensures that CoasterRugs do their job: Protect your surfaces from your drinks. They're also non-slip. CoasterRugs feature an eighth-inch-thick rubber backing which prevents sliding and protects your surfaces. Although each CoasterRug looks like a delicate hand-made mini tapestry, they are by no means fragile. In fact, the Lextra material used for the surface of CoasterRugs is so tough that Dodge selected it for the Ram logo on their trucks' floor mats. Cleaning CoasterRugs is not necessary maintenance; however, if they absorb a nasty spill, cleanup is easy. Simply wash it with water. 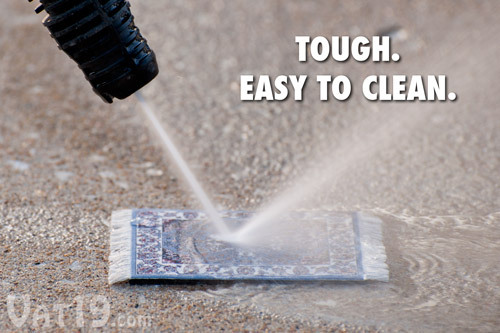 CoasterRugs are so tough that you can even use a pressure washer without any fear of damaging the CoasterRug. If your ultra-tough CoasterRug gets filthy, don't hesitate to bust out the pressure washer. Your CoasterRugs can handle it. 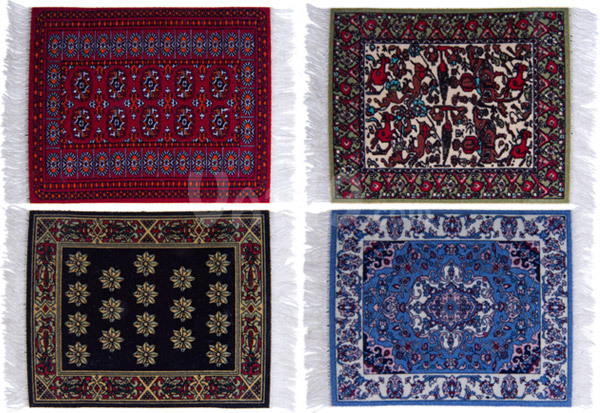 Each set of CoasterRugs includes four different designs. We currently offer two distinctive four-packs. Obviously, you should buy both (and our Computer MouseRug) for maximum mini rug cuteness. Each pack of CoasterRugs includes four drink coasters. 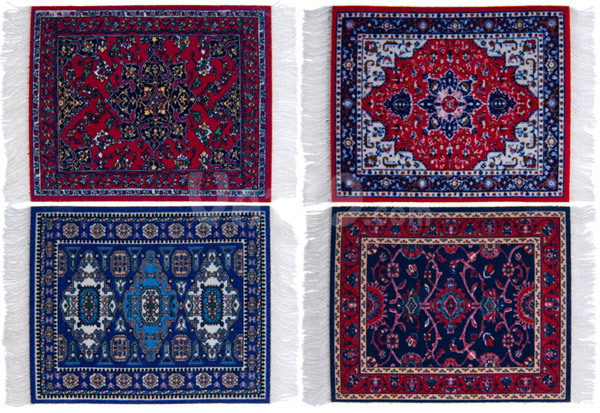 The Oriental Pack includes one each of the following designs: Star Ushak, Ardabil, Deep Blue Bergamo, and Tabriz Heriz. 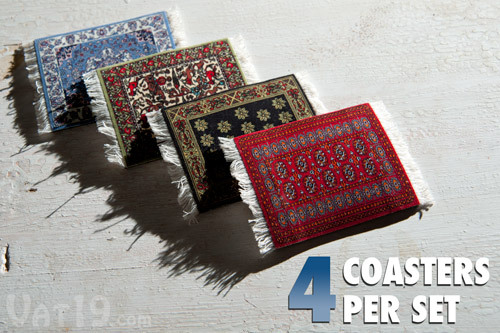 The Oriental 4-pack of CoasterRugs. The International Pack includes one each of the following designs: Jade Fars Pictorial, Contemporary Jaipur, Country Heritage Stars, and Maroon Bokhara. The International 4-pack of CoasterRugs.